RECORD-BREAKER: The boys double-check everything is hooked up properly for the March 29, 2003, longest road train world record run at Mungindi. THE little town of Mungindi is ready to celebrate like its...2003! 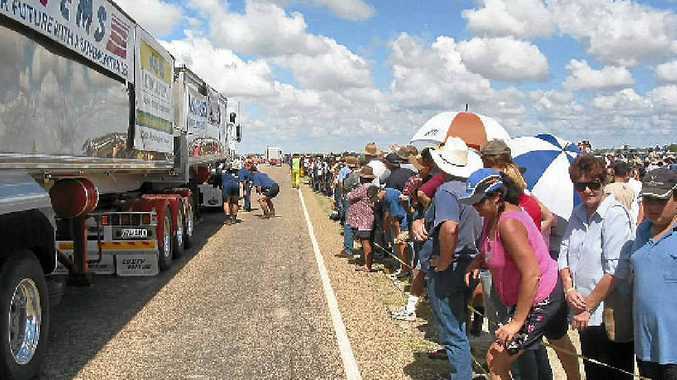 Yes, you read that right, 10 years ago the Queensland town played host to the record-breaking Guinness World Record longest road train and now they are ready to celebrate the feat with a mighty Mungindi Truck Pull Reunion. 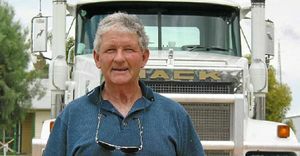 Mick Boyce, the organiser of the event all those years ago, told Big Rigs that the record was broken again in Western Australia, soon after Mungindi, but he'd managed to beat it yet again in Clifton in 2006 with nearly 1.5km of trailers (113) pulled by one prime mover. But that original world record in Mungindi saw 87 trailers hooked up in a few hours, the length was just over 3km. "Mack made the truck for us," he said of the prime mover that pulled them all. That Mack, driven by John Atkinson managed to pull 10 times its own weight; John also drove during the 2006 record-breaking event at Clifton. Just like 10 years ago, Boyce said there would be high flying entertainment from planes and helicopters. Singers Juke Dickens, Jess Holland and Jeff Brown will entertain with other musicians during the event, which has been sponsored by Mack trucks. The event which features a truck show, full concert and plenty of activities will also be a fundraiser for cancer charities and the Westpac Rescue Helicopter. There will be a truck and B-double reversing competition, which will include hooking up trailers. And an entertaining man-versus-machine tug of war. The reunion will be held on March 23 at the Mungindi Showgrounds. Gates open at 11am. Truck show categories include best new Macks under and older than eight years, best vintage restored truck and best truck of show - which will be people's choice. Entry is $10 per category and there is free camping. Contact Laurie Whittaker on 0418 672 170 or Ian Heferen on 0427 523 203 or visit munginditruckpullreunion.com.